Located 10km east of Belfast, the Stormont Estate is home to numerous Northern Ireland Government buildings, as well as the grand Parliament. It is a large green space consisting of a grand alley approaching Parliament, woodland trails, and pretty grounds. In all, one can put together a good 5 km run within the grounds of the estate. 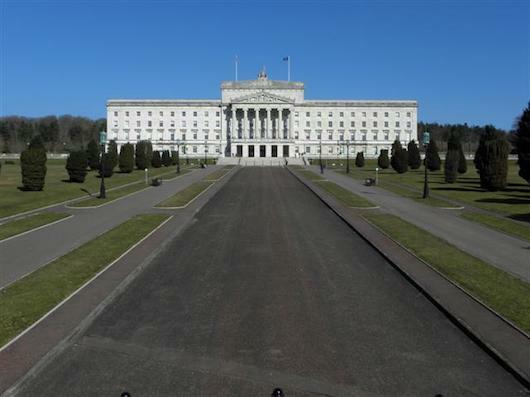 The highlight is the 1.2 km approach to the Parliament from the Stormont Hotel Upper Newtownards Rd., a wide road flanked by paths and grand trees. Wooded trails are on the left side of the road as you approach Parliament, and more open paths circle the grounds of Stormont Estate on the right. Add-Ons: Stoney Rd., which runs along the Knock Golf Club, is nice for running — some sections narrower and lacking a sidewalk. Castlehill Rd., just to the west, has nice homes and landscaping and a good sidewalk for running. Site of weekly 5k Parkrun, Saturdays 9am. About 5k overall on the grounds.